Kibana is a web application that you access through port 5601. All you need to do is point your web browser at the machine where Kibana is running and specify the port number. For example, localhost:5601 or http://YOURDOMAIN.com:5601. When you access Kibana, the Discover page loads by default with the default index pattern selected. The time filter is set to the last 15 minutes and the search query is set to match-all (\*). If you don’t see any documents, try setting the time filter to a wider time range. If you still don’t see any results, it’s possible that you don’t have any documents. You can reach the Kibana server’s status page by navigating to localhost:5601/status. 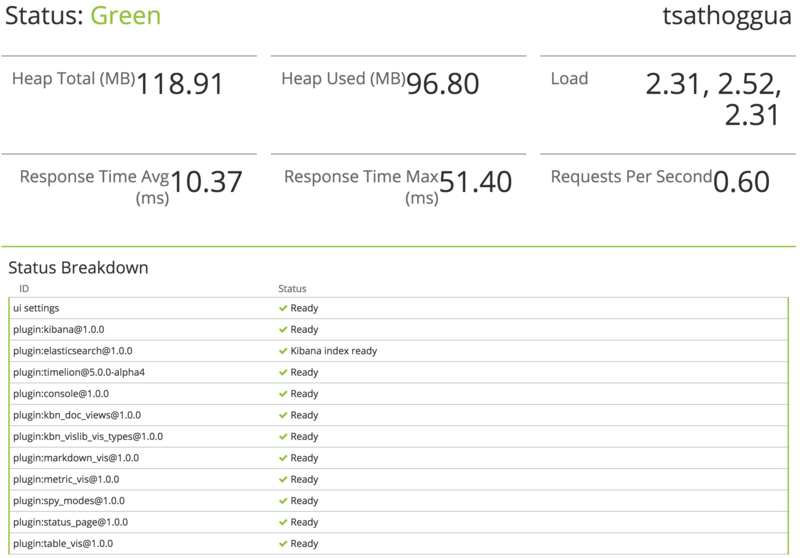 The status page displays information about the server’s resource usage and lists the installed plugins.